Peter Cushing! Christopher Lee! Each is at the top of his game, playing competing collectors of occult incunabula — the kind that comes with a satanic curse, when the purloined item in question is the Skull Of The infamous, despicable and sharp-toothed Marquis De Sade! Freddie Francis directs up a storm in this amicable Amicus chiller: the mysterious skull-duggery is beautifully shot and edited, giving the horror scenes real Bite. Starring: Peter Cushing, Patrick Wymark, Nigel Green, Jill Bennett, Michael Gough, Ceorge Couloris, Christopher Lee. Nine years ago Legend Films brought us a DVD of this 1965 horror item, which finally let viewers see it in its original widescreen Techniscope framing. KL Studio Classics has been accelerating its Hollywood-licensed product lately, with so many attractive genre pictures getting the boost to HD, that we wonder how soon the studio coffers will be completely emptied of desirable titles. In 1965 most any English horror film would be compared to the output of Hammer Films. The Skull has a flashback or two to a gothic setting, but most of the picture plays out in modern times. Bizarre happenings play out amid London’s fanciers of satanic collectables: Dr. Christopher Maitland (Peter Cushing) bids on some occult statues only to see the auctioneer award them to Sir Matthew Phillips (Christopher Lee), who readily admits that he doesn’t know why he felt compelled to purchase them at any cost. The disreputable dealer then Anthony Marco (Patrick Wymark) brings Maitland a fantastic find — the skull of the Marquis de Sade, here identified not as the political radical and notorious libertine, but as a mysterious occultist. When Maitland talks about the offer, Sir Matthew advises him to refuse delivery — warning him that the skull has brought disaster to all that possessed it. Maitland chides Sir Matthew for taking the supernatural so seriously, but he soon experiences a bizarre dream in which he visits Marco’s apartment. Marco is subsequently found with his throat torn out, but Maitland still wants the skull. Little does he know that the artifact is already influencing his mind, urging him to do terrible things … like kill his wife Jane (Jill Bennett). The Skull is a ‘straight gothic’ in that it doesn’t attempt to rationalize its supernatural content with science. Writer Robert Bloch also wrote the source book for Psycho, the main instigator of the rising ’60s trend of psychological ‘horror of personality’ films: What Ever Happened to Baby Jane?, Pretty Poison. But ghost and possession stories remained popular. Amicus would soon hire Bloch to write some of its anthology films. The Skull relies on the notion that demons from hell can invade our world through specific relics and profane totems. In this case, it’s been decided that the Evil of the infamous Marquis de Sade lives on through his skull. The film’s prologue shows a 19th century phrenologist robbing a graveyard to obtain the Marquis’ head. He is murdered under mysterious circumstances, and 140 years later the skull continues to kill. Sir Matthew Phillips was compelled by the skull to obtain other relics bearing occult powers. He’s glad when the skull is stolen from him, because another unlucky collector will now inherit its curse. Ably staged and smartly photographed, The Skull shows little of the economizing that plagued later Amicus films. The sets are large and well appointed. Freddie Francis’s mood lighting is excellent. As a director he frequently keeps his camera in motion, circling the action or otherwise drawing our attention to what that cursed skull is up to in the corners of the frame. Elisabeth Lutyens’ score sets an unusual mood and then punctuates it with frequent musical shocks. The eponymous skull floats about the room, an effect done well enough to avoid the silliness of the rubbery crawling hand of Dr. Terror’s House of Horrors. It is said that after de Sade’s death, phrenologists did indeed inspect his skull for abnormalities. The film’s extravagant fantasy imagines that the Marquis’ spirit, or perhaps just his skull, is in league with The Devil and possesses satanic powers. If a storyteller is going to add a supernatural element, it’s best to ‘go all the way’ as does The Skull. The film’s most memorable effect is a weird point-of-view angle from behind the skull’s bony eye sockets: as the characters try to figure out what’s going on, they’re clearly being observed by the spirit of the evil Marquis. Interestingly, standard subjective camera logic infers that the skull-mask framing effect should put US in the position of the evil Marquis, or The Devil, which is neither the intention nor the effect. The green-glowing skull-frame sets the film apart yet still feels like a gimmick, as if the theater ushers might hand out cardboard glasses that look like they’re made of skull bones. Producer-screenwriter Subotsky’s adaptation stretches out Robert Bloch’s story, adding a few sequences to reach a minimum running time. Maitland’s nightmare is a strange torture session, embellished with a scene of his arrest by a pair of suspicious detectives. The nervous collector is taken for a ride in an unmarked car, a sinister trip that director Francis patterns closely after Henry Fonda’s subjective ride to jail in Alfred Hitchcock’s The Wrong Man. Peter Cushing’s performance as the helpless pawn in this surreal sequence, makes the difference. Otherwise, The Skull works up some eerie horror thrills. The polished direction shows that Freddie Francis clearly gave The Skull his best shot, bettering Hammer product from the same year. Frequently alone on the screen, Peter Cushing carries the film with ease, just as he did his breakthrough 1954 BBC version of 1984. Wymark’s disreputable antiquities dealer is suitably evasive about the nature of his merchandise; both he and Christopher Lee’s aristocrat play their parts as if partially under the influence of the evil skull. The flashback to the early 1800s is stock stuff done as well as in any Hammer film. Room is made for a brief bathtub scene by giving the grave-robbing phrenologist a saucy girlfriend. Nigel Green receives elevated billing but has little to do but grumble over a couple of bloody, off-camera crime scenes. Behind him on a table rests the skull, hiding in plain sight. The Skull works as a ghost story because moments like that one never seem ridiculous. The KL Studio Classics Blu-ray of The Skull works up a full old-fashioned special edition presentation for this interesting horror item that was released fairly bare bones on DVD. I can only surmise that competition between Blu-ray boutique labels for genre product is responsible for pictures like The Skull being given worthy attention in the extras department. The old DVD sometimes looked a little mushy, but this HD encoding makes the image pop. The Skull was filmed in the two-perf pulldown format Techniscope, which yields a 2.35:1 image understandably granier than full four perf CinemaScope or Panavision. Because Techniscope is non-anamorphic, a crack cameraman like Freddie Francis could use superior flat optics to close the image-quality gap. Not having to deal with an anamorphic system’s poor depth of field and ‘warp-o-scope’ optics allows more creative, ‘extreme’ lens effects, as with a choker close-up of Christopher Lee (right → ). When Francis wants the effect of an extreme depth of field, the fast flat lenses allow him to get it without using split diopter tricks (just above ↑ ). This accounts for the intimate feel of those prowl-around-the-room scenes… Francis has more fluidity of camera movement here, than was practical for his brilliant The Innocents, which was filmed with ‘improved’ CinemaScope lenses. As with the earlier The Man Who Could Cheat Death, Kino gives us two lengthy video lectures from English horror experts Jonathan Rigby and Kim Newman. Although they cover the same material and often make the exact same observations, the authors’ personal perspectives differ as much as their speaking styles. Each has the peculiar English skill of pontificating on a topic without so much as a hem or haw, yet framing their intelligent thoughts in perfectly balanced sentences. One of them ought to run for public office, on the Certificate ‘X’ ticket. Also tackling the limited scope of the Amicus film is Yank commentator Tim Lucas, with a track that goes light on the studio politics and instead stresses a close read of Freddie Francis’s directorial choices, looking for rhyme and reason behind the film’s visual motifs. Lucas points out the way Francis brings the skull to life by simply having it inexplicably change position or location between cutaways, a basic but highly effective choice. The film’s color schemes also fall into a pattern, with the purples and greens assigned genre meaning by Lucas. The film’s best passages may be its mostly wordless transitional scenes. A long sequence of Peter Cushing reading gives us a mini-tour of his well appointed study with its collector’s trophies. Nothing happens yet Francis keeps the frame alive at all times. I also never appreciated the Kafka-like spooky arrest and detention scene before, and now it plays quite well. I think it’s because Lucas points out early on that Cushing’s character is being criticized. Maitland claims grand academic motives, when he’s really a fan-boy of the occult and equally susceptible to its negative power. This reviewer is a hard sell when it comes to supernatural murder mysteries, but the commentary makes a fine case for The Skull having exceptional merit. 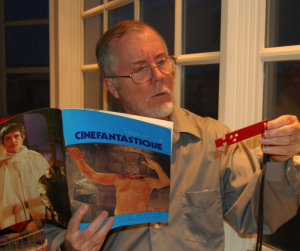 Francis brought such intelligence and artistic skill to his film work, that it’s sad to know that the horror genre became a dead end for his directing career. Also present is Joe Dante’s “Trailers from Hell” episode on the show, with the coming attractions piece with the campy narration: “Casting Its Hypnotic Trance Over All Who Fall Under Its Hideous Shadow!” Kino ladles on several more trailers from its fast-expanding stable of horror hits. 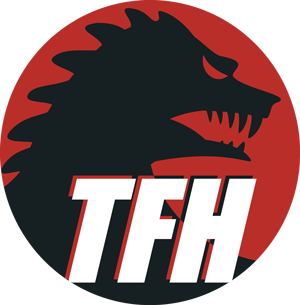 Supplements: Tim Lucas commentary; lecture featurettes from Jonathan Rigby and Kim Newman; ‘Trailers from Hell’ episode with Joe Dante; trailers.